whereas Groves has slick boxing skills. Few words ringside from Prince Nasem Hamed, he might have lost the fitness he once had, but not a jot of the confidence! He predicts Carl Froch will do the business in four rounds 'one hundred and fifty million per cent'. Has Groves got the boxing skills and power to trouble Carl Froch? Is Froch's style too predictable? Will age or experience be the deciding factor? Froch is looking timid right now, slightly hesitant. Groves catches him again with an overhand right. They tie up on the ropes and Groves digs in with his head. A little bit of needle still. Another clear, clear round for Groves, completely outclassing Froch so far. Better from Froch at the start of the fifth, seems more assertive. Froch landing more often now, Groves looks to have taken his foot off the gas a little. First round for Carl Froch, connected more regularly and seemed more confident. Round six, not much action in the first minute. Groves lands another big right hand but they bounce off Froch's granite chin. Anyone else would be out of there. They're slugging it out, toe to toe! Fantastic action, a clear round for Groves but Froch refusing to make it easy. Bell goes for round seven. Groves is five rounds up on Jim Watt's card, ours too. Froch catches Groves with a decent shot, George's turn to shrug it off. Groves turns on the style again, quick jabs and right hands. Froch getting hit with clean shots again. Bell goes just as Froch launches an attack. Another round for Groves. Round 8 - Froch catches with a big right. Groves looks shaken but gets back to business. The ref warns Froch for using a forearm and gives Groves a few precious extra seconds to recover. Groves is getting caught again, seems to be taking another 'round off'. Dangerous tactic against a power puncher like Froch. Froch warned by the ref for punching after the break again. 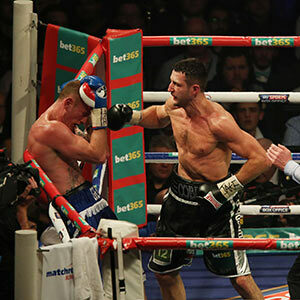 It wasn't pretty to look at, but that was another round to Froch. This has the look of Rocky v Apollo Creed about it: One boxer with slick skills and speed, the other with power and heart. Groves is in big trouble, Froch caught and now smells blood. That never should of been stopped there, made up Froch won though!! Groves was ahead on all the judges scorecards, won the respect of the crowd and surely Froch too. Froch and Groves seem to have settled their differences however. After a tense chat in the centre of the ring they embrace and raise each other's hands. Froch: I thought it was a fair enough stoppage.